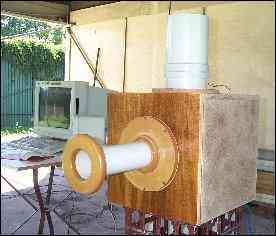 A 50 litre test box was built as a cube to keep all the box resonances at a single known frequency (447hz). Two 10 inch holes were made - one for the port and one for the driver. The small length of the test port meant that the port resonance was expected at 573hz. 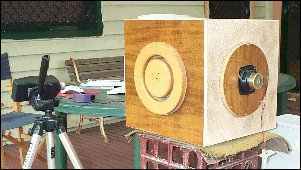 This is well above what a subwoofer driver would go to, so a set of computer speakers was butchered to supply a midrange driver and its amplifier. The driver was mounted on a 10inch disk. An SPL meter was mounted close to the port, and then with a signal of 570hz (predicted port resonant frequency), exciting the port, the meter was moved backwards and forward till the highest response was detected. This was to avoid being in a "null" for the very frequencies that were of most interest. With the standard port installed, SPL readings were taken from 400hz to 680hz in 5hz steps. The concentric port (with damping pads) was then fitted and the measurements taken again. The pads were then removed and the concentric port re-tested. The midrange driver assembly was replaced with a subwoofer driver and powered with the 350w amp used in the "Blast Furnace". The standard port was fitted and a test passage containing 30hz content was played at increasing levels until "Chuffing" became evident. There appears to be no point in using this design in its current form. It may be possible to decrease the chuffing by using endcaps made on a lathe which could ease the air into a U-turn, rather than slamming it into a the cap at 90 degrees. I'll leave that up to other researchers....oh well, I had some fun! All the maths will make your head explode! Here is an easy to use calculator that does it all for you. It works out the pipe lengths and end gaps for 3-layer and 5-layer ports. 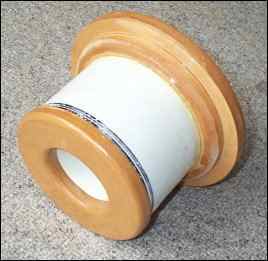 It also works out the sizes for making a composite tube of any diameter. Input the size of the small tube and the wall thicknesses and it does the rest. Play around with different wall sizes to arrive at the sizes you want. 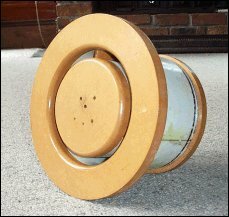 If you are unable to source a pipe of a particular size, you can make it out of 2 layers of PVC pipe. The software has an extra utility which will help you to work out how much to cut out. Only works in mm - aplogies to UK and USA coneheads..
Concentric.exe is written in Visual Basic 6 and runs under Windows.